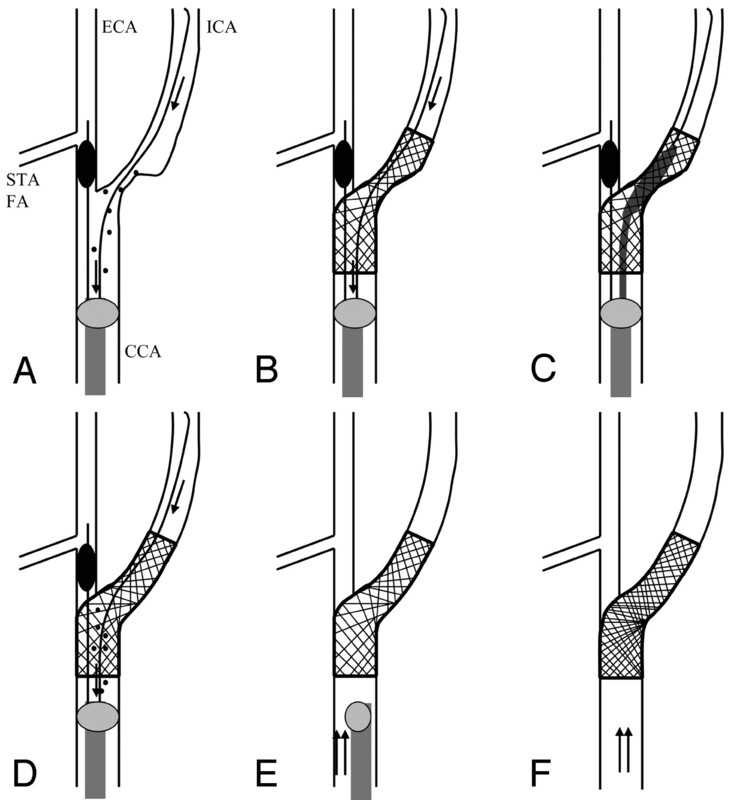 A, Flow reversal from the intracranial ICA by blockade of both the proximal CCA and ECA. D, Irrigation of debris by flow reversal. E, Return to normal flow. 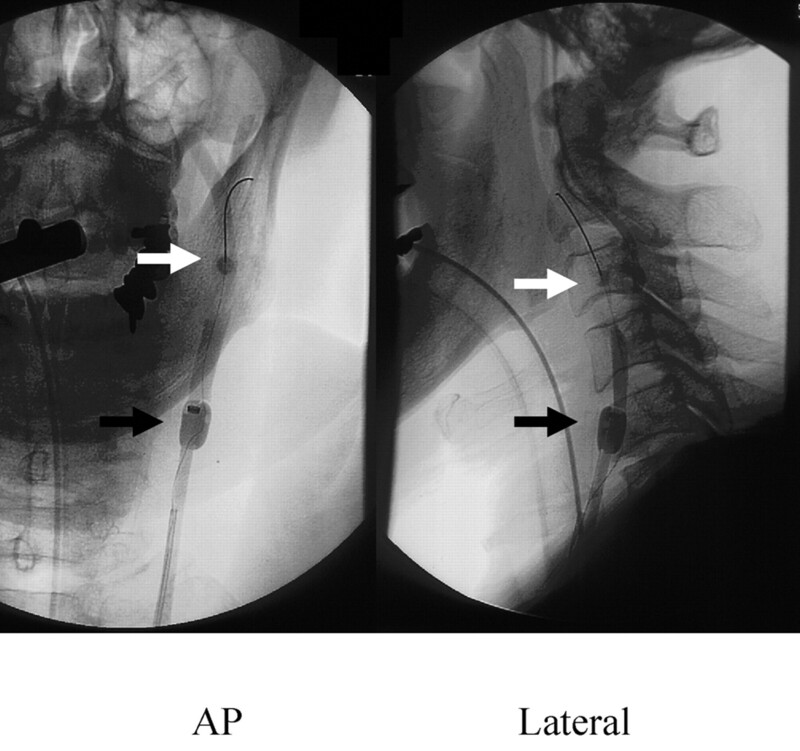 Carotid angioplasty with stent by Parodi Anti-Emboli System (left carotid angiogram, anteroposterior and lateral view). White arrow, blocking balloon in the external carotid artery; black arrow, proximal blocking balloon in the common carotid artery. Ischemic lesions after carotid angioplasty with stent by Parodi Anti-Emboli System (diffusion-weighted MR image). Top, Case 8 (after left carotid stent placement). Bottom, Case 9 (after left carotid stent placement). Note:—ACT indicates activated clotting time; MRI-DWI, magnetic resonance imaging–diffusion weighted imaging; TIA, transient ischemia attack; HTN, hypertension; DM, diabetes mellitus; HL, hyperlipidemia; DVT, deep venous thrombosis; CRF, chronic renal failure; OMI, old myocardial infarction. Averages are as follows: age, 69.7 ± 7.8 years; stenosis ratio, 85.4 ± 8.5%; occlusion time, 722.5 ± 255.2 seconds; ACT (control), 146.1 ± 15.2 seconds; ACT (during procedures, 329.5 ± 80.7 seconds. 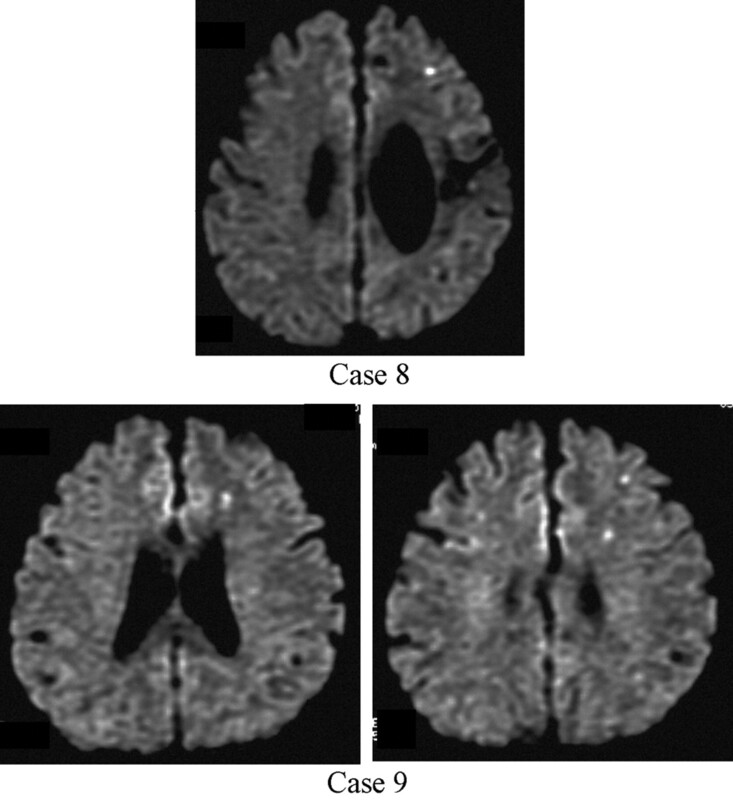 Note:—MRI-DWI indicates magnetic resonance imaging–diffusion weighted imaging; DSA, digital subtraction angiography; within the DSA study column, 4 vessels, bilateral common carotid arteries and bilateral vertebral arteries, and 6 vessels, bilateral internal and external carotid arteries and bilateral vertebral arteries; IC, internal carotid artery; MC, middle cerebral artery; VA, vertebral artery; AVF, arteriovenous fistula. Average age was 58.3 ± 15.3 years. Note:— MRI-DWI indicates magnetic resonance imaging–diffusion weighted imaging.